Looking for waterproof jackets? Check out our Buyers Guide! A true mountain sports enthusiast can be found outdoors whatever the weather. No matter if it storms, rains, snows, or if the sun burns mercilessly, equipped with sufficient protection from the elements like waterproof jackets or waterproof trousers you can make your very own climate. Today, waterproof jackets for men and women don't only serve the purpose of a simple rain jacket. Modern hardshell jackets come with a reliable coating against wetness, cold, and wind. The waterproof jacket has therefore become one of the most important elements of a perfectly equipped ski or hiking tour, and is a trusted companion for climbing tours in the mountains or expeditions in lofty heights. 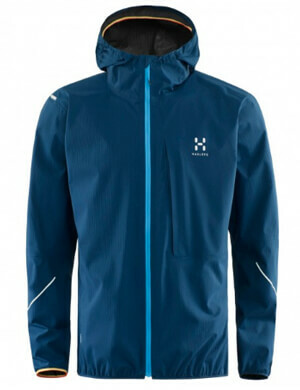 Hardshell and softshell jackets are used for all kinds of mountain sports. Different material compositions offer different qualities depending on purpose. There are ultralight and extremely breathable hardshell jackets for particularly active sports such as trail running or ski mountaineering. Most waterproof jackets are equipped with breathable membranes like GORE-TEX or Sympatex. Multi-layered waterproof jackets are a lot more robust and hard-wearing. When it comes to challenging activities like climbing or trekking, they easily withstand the greatest strains. When carrying a heavy backpack, you should make sure your waterproof jacket is robust enough to resist permanent strains over longer periods. Ultralight rain jackets are not designed for such challenges. You can also wear a waterproof poncho or waterproof coat on long hiking trips. Some waterproof ponchos are even big enough to be worn on top of a backpack. Thus you will stay perfectly dry to your ankles. And this is where your waterproof shoes come into play. Only your hands will be exposed to the rain, but even this problem can be solved by means of waterproof gloves. Waterproof jackets are the functional link between body and environment. For this reason, almost every modern hardshell jacket comes with a membrane providing you with a balanced body climate at any time, regardless of the prevailing weather conditions. Steam and excessive heat generated during athletic activity will be wicked away from the body, while cold and wet is kept out. The water column and RET value will give you an idea of how waterproof and breathable a particular waterproof jacket actually is. The higher the stated values, the denser the material of the hardshell jacket, and the better the heat regulation inside the jacket. And should a waterproof jacket actually reach its functional limits at some point, then there are various ventilation openings to help you out. A waterproof jacket and its wearer should be in harmony at all times. That means: it should not hinder movement or performance, and should never give up when it comes to the crunch. For this reason, modern jackets are designed with much attention to detail and are capable of meeting even the highest requirements of physically active users. The jacket pockets, for example, are positioned in such a way as to ensure that important utensils can easily be reached while the wearer carries a backpack or wears a harness. The hood is cut widely as well and can be adjusted by means of rubber cords. Thus you can even wear a helmet underneath the hood without your field of view being restricted. Hardshell jackets by Bergans, Vaude, or The North Face are of high quality and come with various functional details. As a mountaineer, you know that regular cleaning and care is important to keep your jacket durable. With special detergents for membranes, hardshells are machine-washable. However, you should restore the beading effect afterwards by means of a DWR spray.